I just updated my servers from 5.5 to 7.2. PHP est configuré pour remplir des données brutes POST. A partir de PHP 5.6, cela va générer des avis pour du code parfaitement valide. Which basically says that because I’m now using a version of PHP>5.6, I have to change a line (always_populate_raw_post_data=-1) in my php.ini. The problem is that even when I create a php.ini at the root of my Owncloud folder with the right line in it, the error message is still displayed. 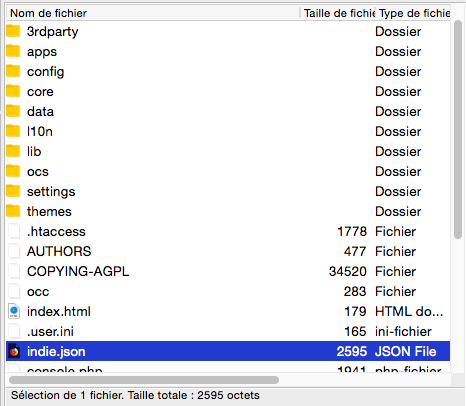 I tried to find existing php.ini file within the owncloud folders, but I did not find any. Any idea about how to get this variable to be accepted by owncloud? Have you looked in your php folder? It‘s generally located at /etc/php/7.0/php.ini I think. I tried to find this folder (/etc/) but I could not. Nor at the root of the server nor in the owncloud folder. How could phpinfo() tell me that a file is in a folder that does not show? Can some folder be “hidden” ? i don’t think that such an outdated version of ownCloud is running with PHP 7.2. You probably need to downgrade to PHP 5.6 again and then first upgrade this ownCloud version before updating PHP to 7.2. again. However, regarding your php question: You are looking in the ownCloud folder. The /etc/ folder in from the root view of the file system. You are now for example in /var/www/owncloud/ and here is no php folder, that‘s correct. You need to go to /etc/ to find that folder. The command cd /etc/ should get you there. This could be because you don‘t have the permissions to access that file / folder.